sounds, after which the Sec. read the constitution and by-laws of the society. 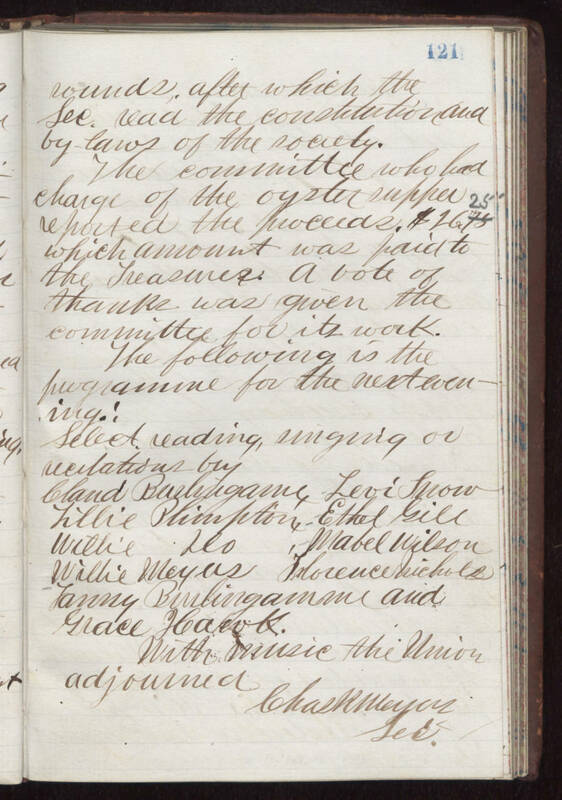 The committee who had charge of the oyster supper reported the proceeds. $26.25 which amount was paid to the Treasurer. A vote of thanks was given the committee for its work. The following is the programme for the next even-ing. : Select reading, singing or recitations [by?] Claud Burlingame, Levi Snow [Willie?] Plimptin, Ethel [Gill?] Willie Leo, Mabel Wilson, Willie Meyers Florence Nichols Tammy Burlingamme and Grace [Hawk?]. With music the Union adjourned [Chask?] Meyers Lee.